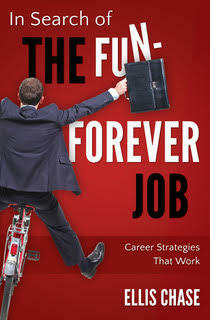 Ellis Chase is author of In Search of The Fun Forever Job and Career Strategies That Work: Networking. As an experienced career management consultant, he is a sought-after speaker, known for his ability to connect with and motivate his audiences. Whether he’s talking to large groups or individuals, whether the subject is individual career development or executive coaching, his energetic style and years of experience in private practice, consulting firms, universities, and corporations get results. "I am always super charged after speaking with you and after hearing you speak - thank you for a dynamic, informative and "tell it like it is" presentation. Students LOVE you." "Ellis, or the Advisor to the Advisors, thanks for all you do to keep the EMBA students well cared for - as a master presenter, coach, programmer, all in one. And, I personally have benefited from your counsel." "Thanks again for everything. I know you always tell me that "this is my job," but you go above and beyond to help me out. Without your help, I would be the proverbial blind squirrel looking for a nut. You have been a tremendous resource, a source of support, and a sounding board for my constant neurosis. I can't emphasize enough how much I enjoy speaking with you. I owe you...big time!"